Hi everyone. I started playing with tags yesterday and made this one with some (fairly) new dies that I just got ... along with some long-retired patterned paper from Stampin' Up! As most of you know by now, I'm don't use patterned paper in my cards very often and really need to work on that! :) I think of myself as a "designer paper collector" :) ... but I'm hoping to use up some this year, adding bits and pieces (so using up scraps at the same time - bonus!) on tags. Last year I made twelve Christmas tags and had so much fun ... this year hoping to make lots more. Once I made the tag yesterday, I left it for a while because I felt I wanted to do more with it. This morning I turned it into a card. This was definitely inspired by my good friend Nancy ... and this fabulous tag card that she made recently. Thanks again for all your inspiration Nancy!! I'm happy with this tag and may make another to use as an actual gift tag. I used my new snowflake dies from Impression Obsession to die-cut the snowflake for the center of the ornament. Then I cut out two of the ornaments (one in silver and one in red - glimmer papers). 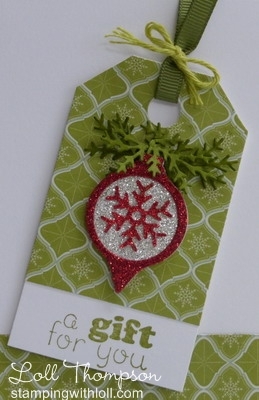 I used my smallest circle nestability to cut out the center of the red ornament and then layered everything together. I used my Tombow glue ... which is amazing ... but it's still a challenge to get these to adhere as there is some sort of plastic-y finish on the back of the glimmer paper from SU!. Tip: Another thing I learned about cutting out glitter paper with small, intricate dies (especially if there is a plastic-y backing). I cut them upside down ... so that the backing paper is on top and it has the most pressure from the sharp edges of the die. You still have to carefully pull the pieces apart after they are cut, but they came out clean for me. Edited to Add: As per a lovely message from MaryH ... I'm going to enter this card into the Pixie's Crafty Snippets Playground Challenge. That's a great tag...and a great tip. I don't use pattern paper too often either, no surprise that I don't wear many patterns. That sparkly glitter circle is perfect. Hi Loll, welcome to the Playground. Beautiful card here and the tag is gorgeous. I've heard MaryH talk about you (or at least write about you) so it's great you came to play. How pretty, Loll! I don't use my DP often enough, but I'm trying to make myself use it. I haven't made tags much either so this is a good combination to work on! 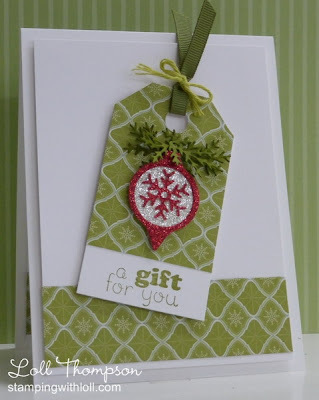 I love this pretty green DSP and the sparkly ornament! You enabled me to get that sweet snowflake die. Thanks for the tip on cutting it from the Glimmer Paper!